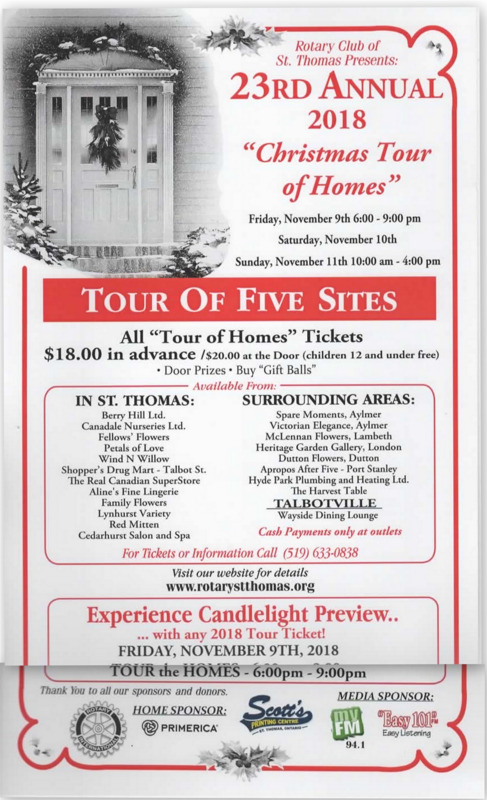 Since 1995, the Rotary Club of St. Thomas has organized and presented the annual Christmas Tour of Homes. The Tour of Homes gives the public an opportunity to glimpse into some of the more interesting, opulent, and exceptional homes in the community. Each home is decorated for the Christmas season with special care by local interior designers, decorators, merchants and floral specialists, creating inspiring seasonal spectacles for the public to enjoy. This enormously popular event serves as a major fundraiser for the Rotary Club, allowing us to contribute further to community projects throughout the year. If you would like to volunteer for the Annual Tour of Homes and be part of the welcoming team at one of the unique and beautiful homes decorated for Christmas, we would be most appreciative of your offer. Each volunteer works a three hour shift (or more if you would like to!). Thank you for your consideration to help make the Tour of Homes one of the St. Thomas Rotary Club’s biggest fundraisers.